Sometimes it’s the silly simple ideas that gets a problem handled. Here is a ‘wish we thought of this’ item we stumbled upon today… ‘Kicks’ from BlueLounge. 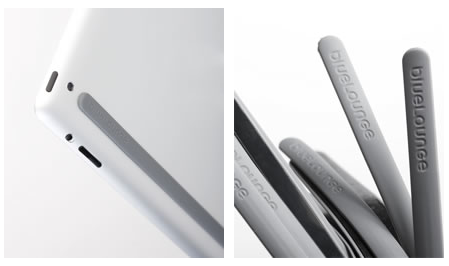 These thin silicone-rubber rails stick to the iPad with 3M adhesive. Which means the Kicks can be put on, removed to move and then re-install. 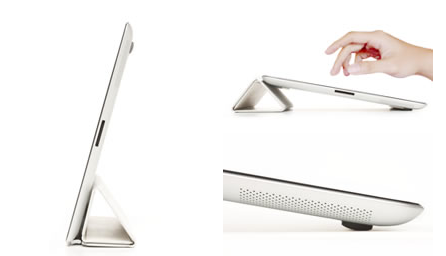 Place a strip along the edge to keep the iPad from slipping around when you have it supported at an angle. They even provide a bit of a grip when carrying your iPad for folks that have trouble holding onto the tapered edges.